You wouldn't know there was a shanty town on Boulevard Ney, were it not for the plumes of thick smoke rising up from the disused rail tracks down below. Invisible from the road, the slum is built along a stretch of the "Petite Ceinture" rail track (French for "Little Belt") — a historic circular railway built in the mid-1800s to connect train stations in Paris. The track, which has remained more or less abandoned since 1934, is today the site of the largest shantytown in the French capital. 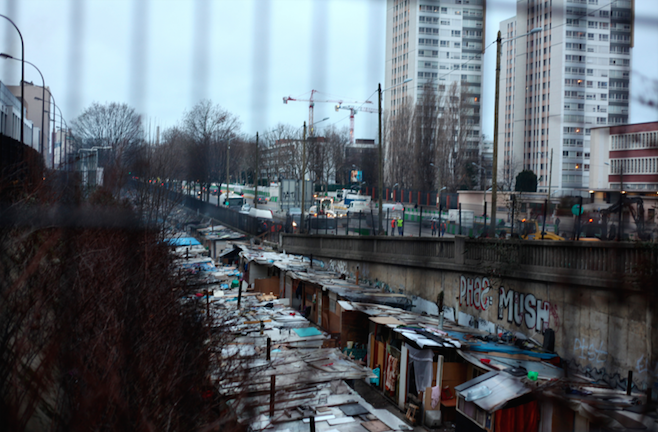 The camp took root in summer 2015, with the arrival of recently evicted Roma residents of the Samaritain slum, in the northern Paris suburb of La Courneuve. Today, some 300 people live in the makeshift village, in 60 or so shacks assembled from various construction materials. Many of the slum's residents are Roma from south Romania or from the country's capital Bucharest. In September, France's state-owned railway company SNCF — which owns the disused rail track — filed a complaint against the residents for unlawful occupation of private land. On September 30, 2015, the Paris High Court ordered the eviction of the residents, who unlike tenants in France, are not protected by the "winter amnesty" — a moratorium on evictions during the cold, winter months. On Monday, residents were told they would face eviction in the coming days, but were given neither a specific date nor time. The area marked in brown is the shanty town. The relationship between France and its Roma population has long been strained, and a harsh government policy of forced evictions has further estranged the already-marginalized community. According to France's Inter-ministerial Delegation for Accommodation and Access to Housing, the police dismantled 111 Roma slums in 2015, evicting 11,128 people. Alternative housing — including temporary housing — was only provided to residents from 29 camps. Visiting the "Petite Ceinture" camp Monday, VICE News found many of the residents preparing for the impending dismantlement of the slum. Others said they had no idea what to do next. "I'm happy to leave, but where will I go?" said Leonardo Lautaru, a 24-year-old from Filiasi, a small rural town in southwestern Romania. Lautaru, his parents, older brother, and 8-year-old sister live together in a wooden shack patched up with tarpaulins at one end of the slum. "My sister goes to school, here," he told VICE News, in broken English. "Sometimes we help our friends, we try to make some money." Two years ago, Lautaru moved to Italy to flee the poverty of rural Romania. In Italy, he found work in a pizza dough factory. "It was very difficult, lots of racism," he said. After returning home one day to find his house vandalized, Lautaru decided to return to Romania, before relocating to France with his parents and siblings. While grown-ups walked past us carrying wooden pallets and bags, the children carried on with their games oblivious, playing tag on the tracks. On Monday, Leonardo and his father joined nearly 200 demonstrators who gathered outside the 18th Arrondissement city hall in the north of the city to call on authorities to delay the eviction by two months. Slum residents, activists and charity workers occupied the square in front of city hall for several hours, surrounded by law enforcement officers from the police and military. "I heard about the protest on Facebook," said Anne-Marie, a local resident in her sixties. "The people around here complain about the smoke coming from the camp, but these families have no choice, this is the only way they can keep themselves warm and cook." A small delegation of protesters was eventually invited to meet with the mayor's chief of staff. Following the conference, the community representatives returned to the square to confirm that the eviction would go ahead as planned this week. Residents, they informed the crowd, would be housed in hotels for up to two weeks, with the opportunity to renew their stay. "That won't improve anything," said Nathalie Jantet, a volunteer from French Christian charity Secours Catholique. "How can we be sure that those families will have a roof over their heads in two weeks' time?" Jantet explained that some of the families might be reluctant to take the city up on its offer of a temporary hotel room, as most of the hotels used for emergency housing are located outside of the city center. "Many of them work here, they help set up [stalls] at the green market, they work in construction, they sell scrap metal," she said. Another issue is that many of the children living in the slum are enrolled in neighborhood schools. Relocating the 60 or so families outside of the neighborhood could potentially interfere with the schooling of dozens of children. In its 2015 annual report on racism in France, the National Consultative Commission on Human Rights (CNCDH) noted a rise in hostility towards the Roma, and denounced the government's preference for "a repressive approach," rather than "a robust policy of eliminating slums through integration." In a report published in 2015, the Council of Europe's Human Rights Commissioner Nils Muiznieks underlined the need for French authorities to guarantee Roma access to healthcare, education, and social benefits, and to combat widespread prejudice against them. "No one likes the living conditions here," said Lautaru. "But it's better than being on the street and much better than Romania." Later in the day, several of the families involved in the protest threatened to march on the Paris prefecture, but were stopped by a cordon of riot police. Lautaru and his family went to find a photo booth to get passport photos for their housing application. "You won't get anything in France if you don't have an address," said a volunteer, who offered to help. "How much does your family earn in a week?" the volunteer asked Leonardo. Leonardo put the question to his father, who replied that the family survived on "40, maybe 50 euros" ($44 to $55) a week. "We don't know what to do," said Leonardo, as his father stepped into the photo booth. "No matter how you look at it, it's bad." On Tuesday, activists met with city officials again to discuss the fate of the slum. "The residents want a written statement from city hall, promising to look into other options aside from hotels for rehousing," said Livia Otal, the Doctors of the World coordinator for shantytowns. "These families already have a history of being evicted and then rehoused," she told VICE News. "They are asking for lasting solutions." When contacted Tuesday by VICE News, the 18th arrondissement city hall told us to get in touch with Paris City Hall, which was unable to respond in time for publication. This story originally appeared in VICE News' French edition. A previous version of this story stated that Lautaru's father had stepped into his house. Instead, he stepped into a photobooth. The story has been amended.